The Peregrine Falcon’s amazing high-speed dives and its ability to seize its prey birds in flight make owning one the highest aspiration of many falconers. Kings once used this swift and beautiful bird of prey in their private hunting ranges. The Peregrine Falcon has been clocked in dives of over 150mph (over 300km/h), making it a truly amazing animal to watch when it hunts. Wild Peregrine Falcons should not be approached as they are very protective of their eyries (nests). They have even been known to attack things as large as helicopters when defending their young, and because they dive so fast, they can kill on impact. This Falcon, like other raptors feeds on other birds as its primary diet. Peregrines hunt their prey during daylight hours (usually birds ranging in size from sparrows to ducks) by circling above them and diving at them at extremely high speeds. 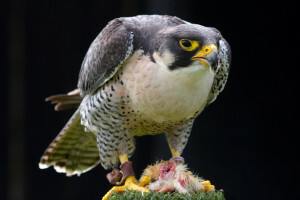 Falcons and other birds of prey are useful in the wild and in urban areas to help control animal populations. Peregrine Falcons can live up to 20 years, and are not generally vocal birds. They will make rapid noises (kek-kek-kek) when disturbed by their nests or in defense, and may repeatedly call out from atop their eyries (wechew wechew). The Peregrine is a very popular bird in falconry. It has a much more manageable disposition than some of the other raptors. This combined with the dramatic hunting dives of this raptor probably account for its popularity among experienced falconers through the years. The Peregrine is a medium to large falcon. 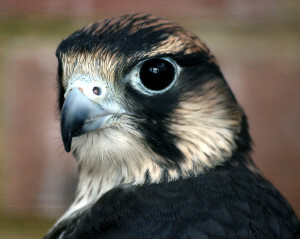 Peregrines, like most Falcons, have dark markings like sideburns and moustaches and dark heads. 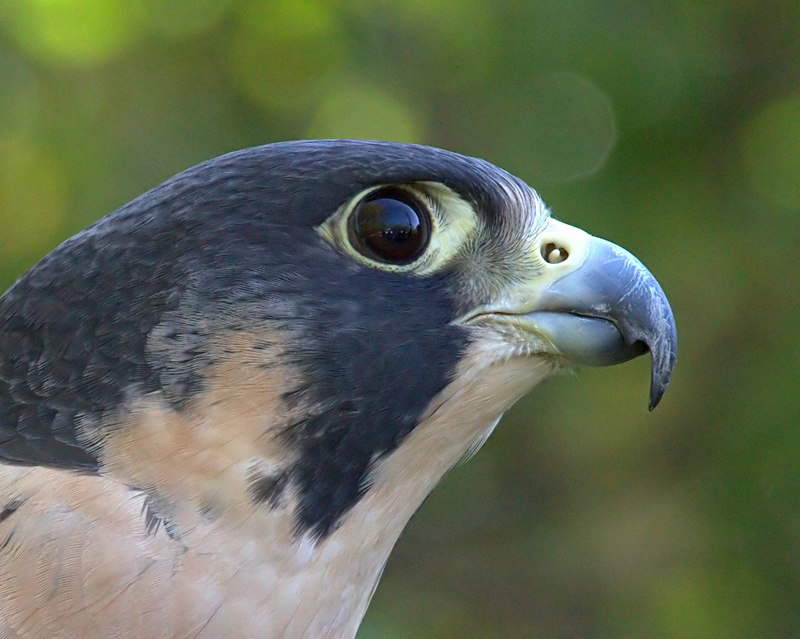 Adult Peregrine Falcons have grey bodies that get paler as you move from neck to legs. The breast can be a white or off-white color that has dark stripes as you move further onto their undercarriage. The tail is also banded. Younger birds look like adults except they tend to be more brown than grey and their markings are darker and more distinct. The young also have a bluish tinge to the skin around their eyes. Peregrines are a medium or large sized raptor, meaning they are similar in size to crows. They are sleek and slim with pointed wings and small heads. Females are distinctly larger than males are more brownish, like the young. Peregrine Falcons are found on every continent except Antarctica. 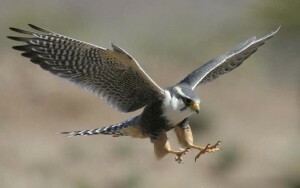 They nest on high cliffs or skyscrapers so that they can easily spot prey, and they prefer open country close to water. Their natural habitat includes open areas in many terrain types, from ocean to mountain. Sadly, these Falcons are endangered in almost every range in which they are found, and extensive reintroduction programs have been implemented with much success. One of the main reasons for their decline is the use of DDT and other pesticides. Besides human beings, they have natural enemies, which include Great Horned owls, foxes, and raccoons. 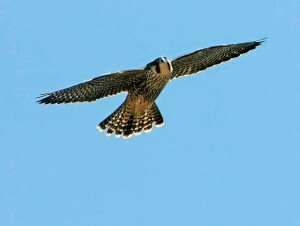 Peregrines are seasonal migraters.As Peregrines are birds of prey and not standard “pets”, obtaining one is difficult. Falconry is a federally mandated hobby in many countries. You must have a sponsor for a two-year apprentice period before getting a general falconry license. The general license is good for five years, and a falconer may obtain master status after this time. So, if you do not have the time or resources to obtain the necessary licenses and equipment, you will not own this or any other raptor. Your state’s Game and Fish Department will have more information on obtaining a license, as laws vary between states. Peregrine Falcons require high flat ledges on which they nest; these falcons do not build traditional nests. Males initiate breeding with complex courtship rituals. 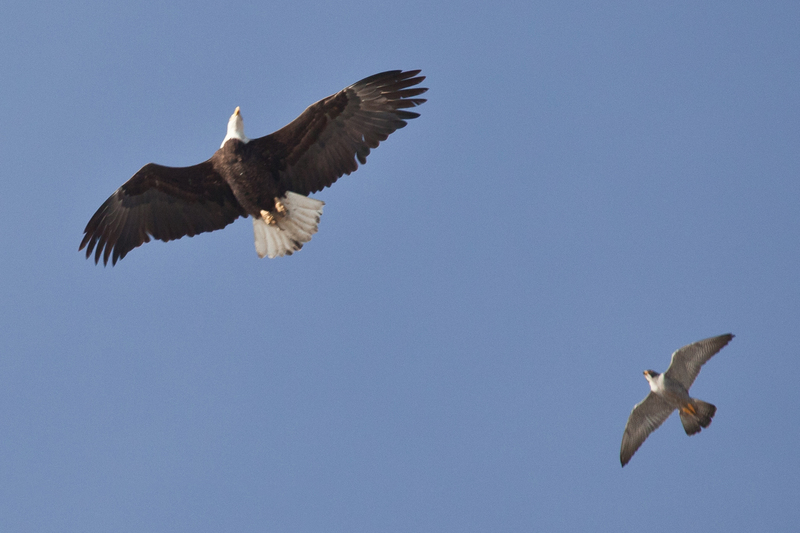 Males are also in charge of finding potential nest sites, and then bring the female to make the final selection. Females will generally begin egg laying between April and July. With each clutch, approximately four pale red eggs with darker red spots will be laid. The eggs are incubated for 28 to 34 days. Both parents help to incubate the eggs. Hatching usually begins between May and August. Babies remain in the nest for 35 to 40 days, and then after learning how to fly they will often remain with their parents for an additional five weeks. Their chicks have mortality rates as high as 50-60% in their first year of life, and this was higher when DDT was used as a pesticide.